Company of Heroes 2 is a game that vexes me mightily. It is almost totally devoid of surprises, a game made to order to satisfy a set of increasingly tired RTS clichés that doesn’t do anywhere near enough to iterate and improve upon its predecessor. It seems that Relic were right to depart from the formula they’d established with the original Dawn of War and CoH and experiment with a smaller, squad-focused setup in Dawn of War 2 – judging from their return to their old WW2 stomping grounds here, it seems very much like they’ve run out of ideas on how to innovate when they don’t have space aliens and laser guns to fall back on. The first thing that will strike you upon starting CoH 2’s single player campaign is that Enemy at the Gates has a lot to answer for. It’s the only high-profile movie the West has made about the Eastern Front in the last thirty years or so, and so it’s gotten to define an awful lot of clichés about how the great videogame-playing masses perceive that particular conflict. This is why the campaign plays, to a large degree, in exactly the same way as the Russian third of the first Call of Duty did back in 2003; they’re both ripping off the only source material Western players are likely to be familiar with. So you’ve got the obligatory first mission in Stalingrad – even though it’s out of chronological order with what happens in the rest of the campaign, although honestly the campaign is just a poorly-ordered series of missions connected through flashbacks (always a bad sign for any narrative) so it doesn’t matter that much – where a cutscene shows Soviet conscripts being sent into battle without rifles and blocking detachments mowing them down when they try to retreat, and then playing the subsequent mission involves marching your men along a clearly-marked, linear route to blow up some AT guns, all the while trying to fool you that there’s a battle raging on around you with a smoke-and-mirrors AI performance. This all sounds achingly familiar, but it’s a setup more often found in… well, in Call of Duty than it is an RTS. 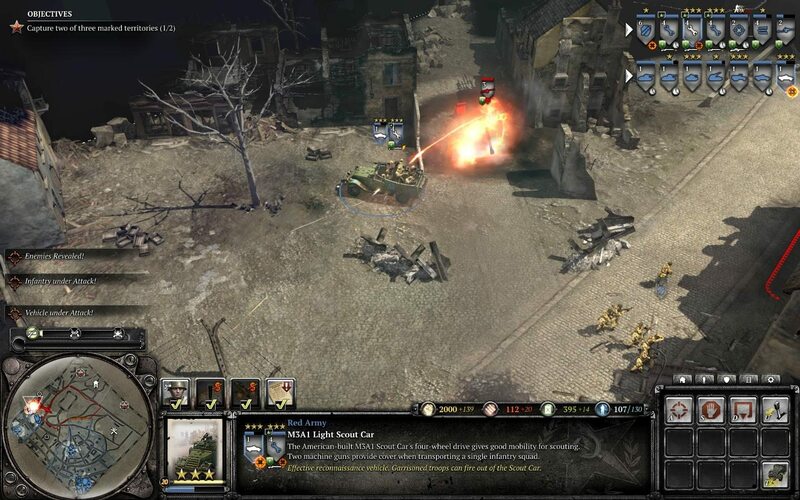 As far as the single-player campaign goes, Company of Heroes 2 has far more in common with the linear single-player campaign from Dawn of War: Retribution, and unlike that game CoH 2 doesn’t have the item system or the fantastic Space Hulk mission to fall back on. The result is something that’s almost astoundingly braindead, with very little tactical or strategic thought required: you progress down the path, you overcome the scripted enemy forces with the appropriate counters (more on this later) and you hit all the objective checkboxes. Most of the challenge comes from wrestling with the game’s awful pathfinding system, which makes vehicles do multiple-point turns reminiscent of Carrier Command’s Walruses when they have to maneuver next to other vehicles, or else will happily reverse a tank straight towards the enemy exposing its vulnerable rear armour. There’s the odd hint of imagination such as the attack across the icy river or the partisan mission, but even here the extra mechanics meant to give the gameplay a little spice turn out to be half-baked at best. For example, the best approach in the supposedly stealth-based partisan mission was to just shoot the Germans in the face and then run away until my partisan snipers had reloaded; the Germans couldn’t run faster than me and they had no vehicles so there was no risk whatsoever. I don’t even know why you’d build the sniper hides or make use of the hold fire command in that one, since all they’d do is slow you down. So the single-player campaign of CoH 2 is one that suffers from a horrifying disease I had previously thought was only limited to first-person shooters: Battlefield 3 syndrome1 There’s a lot of explosions in the campaign missions, a lot of noise and spectacle and visual hooplah, but none of it really impacts the gameplay at all. When you peel back that impressive-looking shell to have a look at the game inside what you find is staggeringly shallow and often follows exactly the same scripted structure as the previous mission; you capture points and kill Germans until you’ve checked the next objective box, and then you weather a German counterattack, and then you check the next objective box. It’s so predictable, in fact, that I found myself doing something I haven’t done since Supreme Commander: holding off on completing mission objectives because I knew that doing so would trigger a massive German assault and I wanted to build up my forces and defences to the population cap to deal with it. It’s an entirely artificial response to an entirely artificial scenario, and is pretty much the antithesis of what a strategy game should be. Strategy games should flow. Strategy games should demand a conscious response from the player. Strategy games should occasionally smack down the player and force them to change their approach. They shouldn’t be this boring. That tedium isn’t wholly down to the mission design, of course. I’m no expert in how the original CoH played, but it seems to me that there have been some under-the-hood changes to how certain units and weapons work. Tanks, for example, seem to be far, far tougher when engaged from the front, to the point where building anti-tank guns is utterly pointless since the tank will simply drive up to the gun and kill the crew before it’s lost more than a quarter of its health bar. Panzershrecks and the like are similarly ineffective; they might threaten the lighter stuff like half-tracks and armoured cars but the inescapable problem is that tanks now have enough health to kill anything that attacks them that isn’t another tank or massed infantry units. For the former, you have to make your tanks bigger and heavier than the enemies. For the latter, you use a scout car stuffed full of engineers with flamethrowers. This is a ridiculous combination that relies on the baffling decision to allow transported infantry to shoot out of the vehicle they’re being transported in. Flamethrowers are absolutely devastating to infantry because they ignore cover and kill instantly, but the tradeoff to fielding them is that they’re incredibly vulnerable to well-aimed rifle shots setting off an entertaining incendiary chain reaction. That’s a fine balance between lethality and vulnerability, but it’s completely short-circuited by transported units being pretty much invulnerable to anything that’s not a sniper until their transport is destroyed – and scout cars are fast enough that unless the car is destroyed in one shot, the flamethrower will be close enough to kill the attacking unit. It’s the tank problem all over again. Most of my campaign missions were therefore played with just four units: two of the heaviest tanks I could build, and two scout cars with flamethrower-toting engineers riding along in the back. 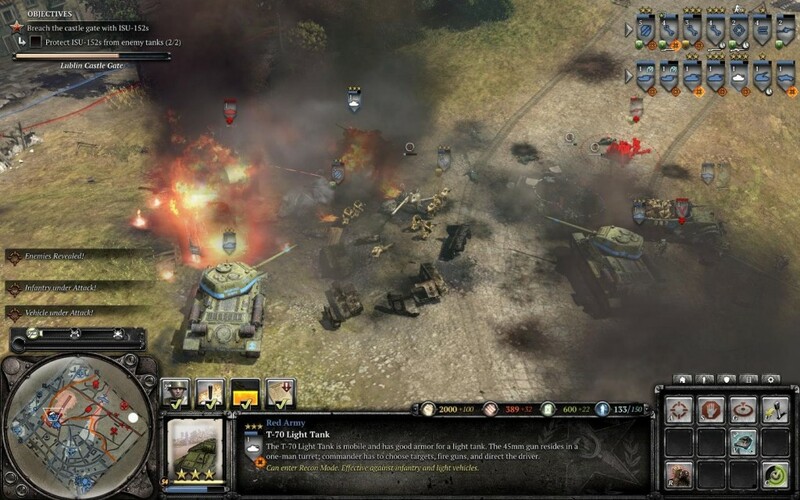 This combination was enough to smash 95% of what the scripted AI forces had on the map; even the heavy 88mm guns that should have been a threat to both of those unit types were rendered useless when I got my scout cars to drive round them circles and they couldn’t turn the gun fast enough to actually take a shot. It’s kind of entertaining to watch but it’s hardly what I’d call challenging, and it completely circumvents the infantry-infantry combat that’s always been the most interesting part of CoH. 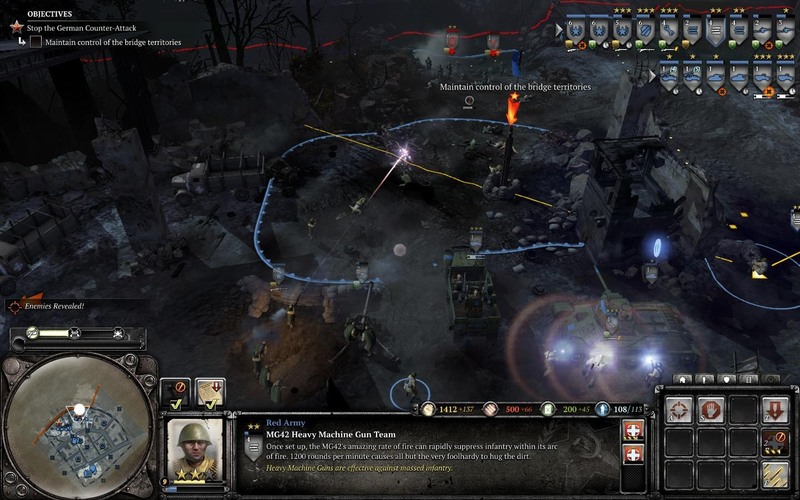 It’s only in the final mission that Relic finally toss some map topography at you that can’t be cleared by scout cars alone, and it proved that when given half a chance it was possible for CoH 2 to present an interesting and knotty tactical problem that required some thought to solve. Unfortunately the campaign waits for eleven hours to present you with the thrilling urban combat that should have really characterised a game about company-level warfare, and you spend most of those eleven hours just going through the motions. Relic seem to be aware that their single-player experience is somewhat lacking, which (I imagine) is why they’ve extended the stock multiplayer levelling and unlocks system to single-player as well. It’s like they didn’t have confidence in the game’s ability to hook people without a steady stream of rewards and a flashy “Level up!” icon after almost every mission, and they haven’t even implemented this stuff with any of the creative flair that Starcraft II displayed since none of it actually affects single-player. It’s all bonuses and unit skins for multiplayer, trying to provide a psychological carrot that’ll keep the player involved and maybe induce them to keep playing the game. Judging by the activity I’ve seen on my usual barometers of internet popularity that’s just not happening; CoH 2 doesn’t seem to be achieving anywhere near the success its predecessor did, and while the dull single-player campaign probably isn’t much of a factor in that (I’m probably one of the few people who bought it who isn’t interested in CoH multiplayer) I’d say that the gameplay changes mean that it is in general a far less compelling experience. 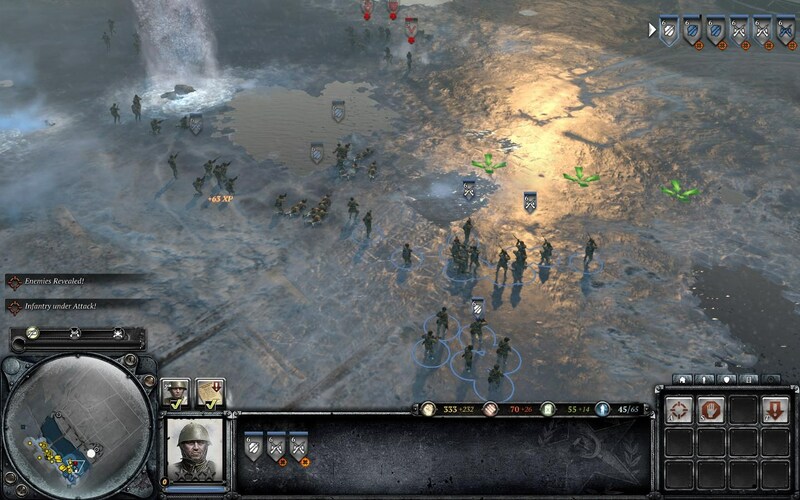 So while there are some minor positive points in CoH 2’s favour – I do like the snow effects and want to see more of that kind of thing in other, better games – it mostly fails to excite any interest on either a narrative or a mechanical level, not to mention failing spectacularly in its hamhanded attempts to evoke the grinding horror of the Eastern Front. Relic’s Warhammer licenses at least made the cartoonish, one-dimensional nature of their participants and plots into a strength. Here that treatment is almost insulting, especially if you know anything at all about history. People keep saying Relic should pick up the Homeworld licence again, but based on their recent output I’d say that they’re better off leaving it where it is; at least that way we’ll have one fondly-remembered old series that won’t suffer the indignity of a staid, unimaginative remake that’d be mediocre at best. Steer clear of this one. Russian soldiers without rifles in Stalingrad?.. Oh, here we go again, Hollywood history at it’s best. Haven’t played the game yet (and not very eager to) but I’m intrigued they’ve remembered partisan movement. It’d be a great gameplay mechanic if Soviet side could capture villages/command points and use stealthy weak units (partisans are the big part of war memory in ex-USSR), though it’s more of a strategic level than CoH2 tactical level. I bet singleplayer is traditionally boring in Relic games. I remember them giving up on SP with the very first add-on to Dawn of War – here you are some Dune 2-style map, go fight 40 multiplayer battles with AI. Company of Heroes had nice cinematics but maybe I have to be American to see something in this boring Band of Brothers stuff. Yeah, the blocking detachment thing also really annoyed me but it was in Enemy at the Gates, which counts as incontrovertible historical evidence as far as game developers are concerned. I miss the days when developers put reading lists in the back of their manuals. It went a long way towards convincing me they knew something about the period in question and weren’t just cribbing from popular media. Also, the partisan mission is just one mission where you’re given a bunch of sniper units and the laughable instruction to stay stealthy. Also they’re Polish. Also *SPOILER* they get executed at the end because in this game the Soviet Union is evil, while the Germans are presented in a very neutral way. For a game about the Eastern front this is, quite frankly, an incredibly ridiculous and shallow reading of what actually happened. My grandparents’ parents’ leading cause of death was “Nazi came to their village, there were no Jews, but they didn’t go all this way for nothing, did they?” (the one man who was a soldier actually survived and still lives although he lost a leg in a battle), so I find it both stupid and hilarious. CoH had neutral Germans and at least tried to show horrors of war Saving Private Rayan-style, and Eastern front was a perfect place to show two bad (from a Western point of view) superpowers in total war. Ruined lives, pointlessness, that kind of stuff. I understand Western audience would like to play as someone more European than barbaric commies, hence come the Polish. But they at least could make something like Winter War were it’s more plausible to make USSR evil. They could show German commanders’ decision to kill civilians to fight partisan movement, Soviets mobilizing everything to fight much more advanced enemy… Ah, Hollywood, you make everything worse. By the way, I’ve noticed Russian localisation was released the same day as English one and there are reviews already. Google quickly gave me the one titled “Company of Heroes 2: Rereading Goebbels” (in Russian, of course). But it seems that Russians aren’t surprised with it and find the plot very amusing and funny. There are some politicians, bloggers and other public people in Russia who paint USSR in similar colors but most of the populace and other public people do not like them much. So I’ll be surprised if the game sells well in Russia. I wonder how much of the game’s failure is due to poor design and how much is due to “this is what WWII is supposed to be like.” There are a lot of depictions of the time period in popular culture, but it’s remarkable how similar they all are. I think we, as a culture, are far from the point where we can produce a work about WWII that is in any real way original. It has been simultaneously enshrined and strip-mined. I’d say that Relic has finally hit that point where the FPS devs of yore found themselves: there’s nothing left to do with this topic. If their next game is bad, well, that’ll be on them. Pretty much. It’s kind of a shame because we don’t really have any evidence of what WW2 games would have been like if they’d been made pre-Saving Private Ryan and its infamous Omaha Beach scene*, since that did for the Western Front what Enemy at the Gates did for the Eastern one two years later. Culturally I think those two movies have a lot to answer for, since while their their depiction of combat was unusually gritty they’re still incredibly Hollywood and reduce an entire war down to a single battle, and if there’s one thing games love to to it’s ape popular movies. *Actually we do. It was called Close Combat, and it was awesome. Well, those Hollywood war movie images have been around for a lot longer than “Saving Private Ryan,” although maybe that was a stronger influence on the younger generation of game devs. I’m thinking of movies like “The Longest Day,” which — aside from all the cheesy cameos from big stars — had many scenes that remind me of what we see in CoH and the WW2 CoD games. Saving Private Ryan was basically just the souped-up version of The Longest Day with better effects and better acting. I’m another one who won’t be doing multiplayer, and I’m regretting buying this in a weak moment while I’m bored with my current strategy games and waiting for Rome 2. I should have waited for a Steam sale. I’m still only partway through it, and I wouldn’t say it’s terrible, but it’s so heavily scripted that I don’t feel much freedom of action. On the positive side, I do like the way they try to give the impression that I’m playing a small part in a much larger battle raging around my guys. Yeah, it’s smoke and mirrors, but I like having at least a few games where my guys aren’t the centerpiece of the conflict. On the other hand, I hate some of the other mechanics, especially the camera field of view. For all that the game is trying to show a big war happening around me, the view feels incredibly cramped. Maybe it’s because I’m using a 4:3 monitor, but even if I shift into widescreen/letterboxed view, it just feels like I can never zoom out far enough to control my units when they’re flanking. I’m spending way too much time sliding the camera around to see what’s going on. If the engine can’t handle the graphics with a wider zoom, then I would have gladly traded off some of that fine detail. I don’t need to see carefully modeled paint scuff marks on a tank. I need to see the battlefield. That idea of using engineers in a scout car is hilariously cheesy! I can’t believe that slipped through beta. Anyway, I agree it’s not what many of us were hoping for — especially if you’re only interested in singleplayer. Wait for a sale, or skip it entirely and hope Rome 2 is successful. I hear what you say, but I didn’t think waves of scripted infantry attacking scripted defences really achieved anything more than watching one of the battle scenes in Lord of the Rings. I almost thought things were going to get interesting in the mission where there’s the other general also attacking the fortress and it looked like I was going to have to race him to my goal. That would have been great from both a gameplay point of view and in terms of making me think it wasn’t just my two carloads of engineers defeating the German war machines. Then he gets bored and gives up, and it’s just another defence-crushing mission. Homeworld often gets mentioned in a positive light, but not having played it (and I don’t think it can even be bought anywhere), I’ve yet to see what the fuss was about. The reviews that exist are from the likes of Gamespot, which might as well be describing different types of table leg for all the critique they deliver, whereas the retrospectives are all crushingly nostalgic drivel pieces that assume you’ve played the bloody thing. In short, I’ve never read anything that explains why they were so good. Homeworld was a triumph of style; it’s one of the most hauntingly beautiful games you’ll ever play in terms of visual and audio design. I *almost* said it was a triumph of style over substance, but that’s not really fair to Homeworld. Its main problem is that it’s the first truly 3d strategy game and it does bugger all with the three-dimensional movement. Moving off the flat 2D plane is rather awkward and tends to get avoided, but if you can overlook that then it’s a decent enough RTS — not *great*, as such, but very atmospheric. I am awful at the original Homeworld; the interface is so much more clunky than the sequels. And yet, the setting is great. I think the reason that love for Homeworld comes off as crushingly nostalgic, is just that it hit all the right buttons for sci-fi geeks (like me), who had been waiting for something… anything… like this in strategy games that came anywhere close to all the sci-fi books and movies we grew up on. Not that the plot or the game mechanics were that good. The 3D tactics, as mentioned elsewhere here, was not as cool in practice as it looked. But nobody else was doing it! It just hit all the right buttons for atmosphere and potential for strategy space games. Sadly, the genre hasn’t progressed much, if any, from there. Right, very few films or games actually get science fiction, and what makes it appealing as a genre beyond a Western with lasers. I am now having flashbacks of being placed opposite Monty in CoH mutliplayer, so thanks for that. Sorry for returning to this, but as you may’ve noticed many Russian gamers were offended by the game judging by steam forums. I haven’t played the game, only watched cutscenes on Youtube, but I think this reaction is due to what CoH1 was. I remember cutscenes from original campaign: we came to liberate those lands, our guys die from German machine guns but we press on for the sake of freedom and justice. No mentioning of Dresden bombings, no civilians were harmed, only spirit of brotherhood and honor. In CoH2 cutscenes I see Russian soldiers that don’t want to defend their homeland and fight back unless Soviet machine guns shoot them in the back. As I understood, all civilian casualties were inflicted by retreating Red Army (I don’t quite understand why would you burn your own villages with people in their houses and then kill your own soldiers). Quotes from mission briefings are from Russian generals that don’t understand why are they fighting… in WW1 in Romania. And, of course, quote from Guderian “I screwed it only because winter suddenly happened and Russians sent billions of meatshields on us”. Maybe it’s all accompanied by cutscenes of Russian heroism and YouTube hides it from me, but ending sequence disappoints the most: we’ve captured Reichstag for a photo, all of this was for the sake of some photo. I’d understood if that would be German campaign: you’re officer that doesn’t quite understands why would you invade some country, kill 13 millions of civilians and lose your soldiers to winter and pointless fights. Russians behave just like they’re invaders, obviously Jewish hero (Lav Abramovich is anecdotal name from Russian jokes about Jews) isn’t reminded that he fights for survival of his country and he personally would end up in Auschwitz if Germans win. Also it’s obvious they didn’t do much research. Every mentioned name sounds Russian, but very funny Russian, almost anecdotal – Isakovich, Churkin etc. They could at least open Wikipedia and get some Russians from there. In any case, I’m ashamed of Russian gamers’ reaction too. Argh.